Arkansas Medicaid Expansion Attracts Other States' Interest : Shots - Health News Arkansas is proposing to enroll people newly eligible for Medicaid in the same private insurance plans available to individuals and small businesses. It's caught the attention of several other Republican-run states that had been holding out on the Medicaid expansion. Arkansas Gov. 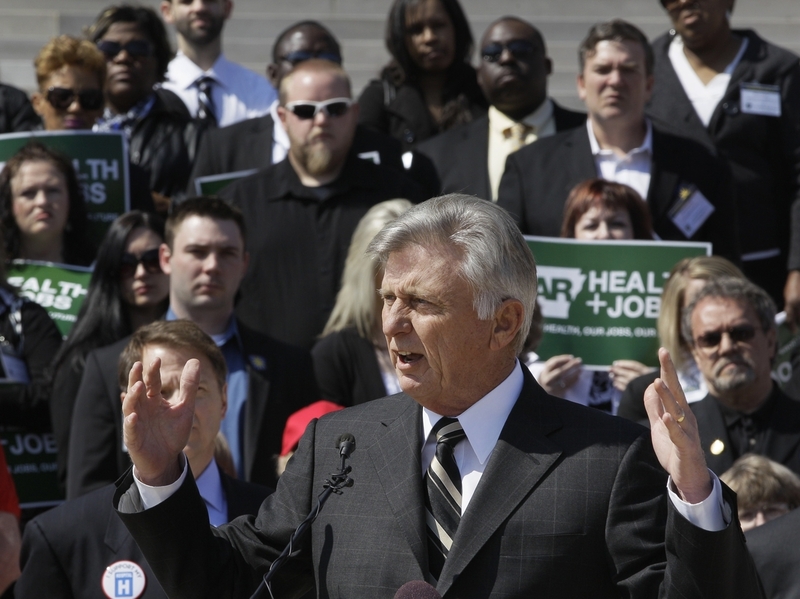 Mike Beebe speaks at a rally promoting the expansion of Medicaid in the state in front of the Capitol in Little Rock on March 7. Since the Supreme Court made the Medicaid expansion under the federal health law optional last year, states' decisions have largely split along party lines. States run by Democrats have been opting in; states run by Republicans have mostly been saying no or holding back. But now Arkansas — at the suggestion of the federal government — has suggested a third option: Enroll those newly eligible for Medicaid in the same private insurance plans available to individuals and small businesses. And some think that could shake things up. A lot. The Arkansas proposal was crafted as much out of political necessity as from substantive desire, says Andy Allison, the state's Medicaid director. "I think this is likely to be the only way that expansion or coverage for this population could occur," he says. There are two reasons for that. One is that the state has a Democratic governor (Mike Beebe, now serving his second term) but a heavily Republican Legislature that has not looked favorably on expanding Medicaid. A second reason is that few adults currently qualify for Medicaid in Arkansas. Those who do have to be really poor, says Allison: "We cover just at 17 percent of the poverty level for those who are parents, and we don't cover childless adults unless they have a disability." For the record, 17 percent of poverty is less than $2,000 a year. Expanding Medicaid under the Affordable Care Act to 133 percent of poverty — about $15,000 — could potentially add as many as 250,000 Arkansans to the rolls. But what was a political nonstarter gained new life when someone suggested the idea of enrolling those new people in the same private plans individuals and small businesses will be purchasing — the new marketplaces, called exchanges. So far the state has gotten a tentative go-ahead from the U.S. Department of Health and Human Services. That has caught the attention of several other Republican-run states that had been holding out on the Medicaid expansion, including Ohio, Florida and even Texas. But experts insist that the proposal is hardly as new as some have suggested. "The authority to use Medicaid funds to buy insurance has been in the law since it was first enacted," said Sara Rosenbaum, a law professor and Medicaid expert at the George Washington University. Still, when the Arkansas arrangement first went public about a month ago, there was some immediate hand-wringing about its potential cost. "We have to ... recognize that it will cost more," said Austin Frakt, a Boston University health economist. "You don't get something for nothing." But Frakt concedes that paying somewhat more — how much more remains a subject of contention — might not be all bad. "One of the basic critiques of the Medicaid program is they pay providers too little and that's why too few of them participate," he said. So putting people in private plans with higher provider payments could help address those access problems. Meanwhile, Medicaid watchers say proposals like the one in Arkansas could solve other problems — for the new Medicaid recipients and for the others who will be buying coverage in the new exchanges. One potential problem the private plans could address is called churning. It happens when a person's income is near the threshold between qualifying for Medicaid and qualifying for federal help to buy private coverage. Imagine, says Rosenbaum, someone working 30 hours a week in the summer, whose hours are cut back, so they qualify for Medicaid part of the year, then expanded, pushing them back out of the program. "And you get a letter saying, 'Now you're earning more money, so now you have to leave your plan. You and your kids have to leave your doctors; you have to pick a new plan.' And then in winter, if your hours drop back down, you get another letter saying, 'Oh, sorry, you have to leave your plan, [and] your doctors,' " she says. "Those people could be forced to change plans multiple times a year." Rosenbaum says enrolling Medicaid beneficiaries in plans in the exchange instead could protect as many as 28 million people a year from churning if their income does get too high. "Your plan will stay your plan, your doctors will stay your doctors," she said. "Basically, the 'bank of Medicaid' and the 'bank of the exchange' will have a conversation with each other about who pays the bills. And your premium may be a little bit different and your copays may be a little bit different, but your health care won't be interrupted." And it's not just those on Medicaid who could benefit. Many of the new Medicaid enrollees will be relatively healthy, relatively young people with relatively low insurance costs. They could help bring premiums down for those in the exchanges who are older and sicker. "It's the woman who's 32 working at Wal-Mart with a couple of kids who we really need in the exchange," Rosenbaum says. "And so if we buy her in and keep her in, it's going to be that much better off for the 55-year-old woman who is sick and unable to work and needs coverage through the exchange because of a lot of health conditions." Still, one of the fundamental appeals of putting new Medicaid enrollees in private plans remains political. "I think in states where the resistance to the Medicaid expansion was based primarily on, 'This is a big-government program that we can't make any bigger,' finding a way to do the expansion through private coverage will open a door to a conversation that was otherwise not taking place," said Alan Weil of the National Academy for State Health Policy. What remains a key issue for many states, however, is that the federal government hasn't yet said exactly how much states can spend on the private plans — only that what they spend to enroll Medicaid beneficiaries in the plans should be "comparable" to what they would have spent otherwise. Health and Human Services Secretary Kathleen Sebelius says officials will spell out more details on that issue "in the very near future."